Hey this guy - you've seen him. 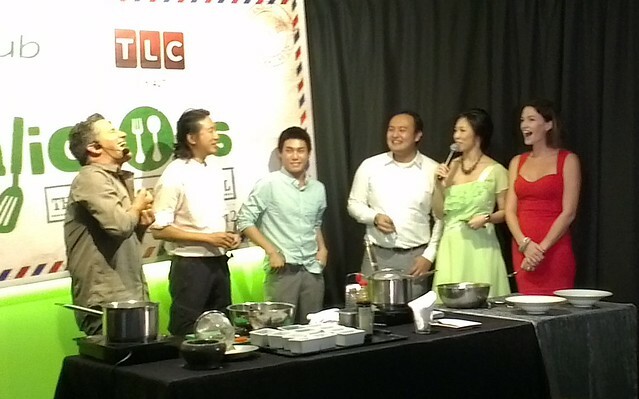 Foodies know and love the star of The Surreal Gourmet and Glutton for Punishment, both shown on TLC (StarHub TV Channel 427). 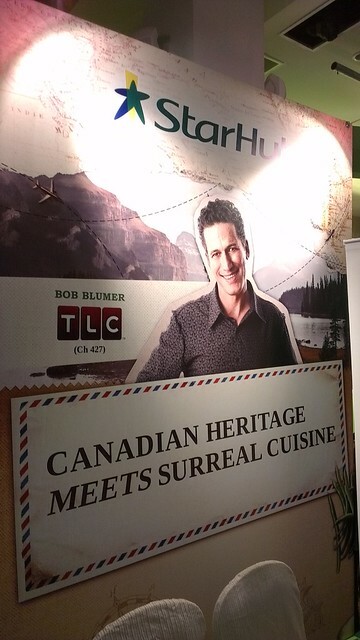 The amazingly candid and amiable Bob Blumer was back in town earlier this month to dish out his take on heritage cuisine at Starhub's Hubalicious event. Bob is Canadian, but he also likes making fun, crazy things to eat, so the special dinner at the Jewel Box was a fusion of both. 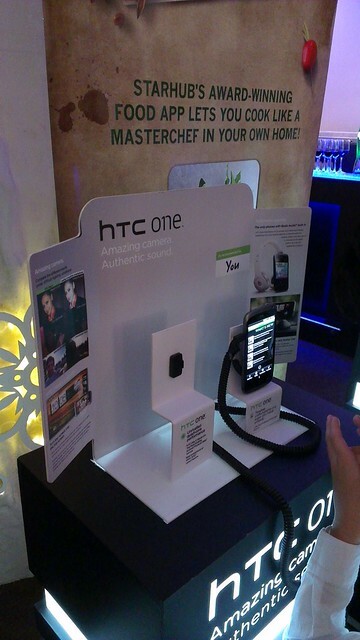 Starhub gave me a HTC One X to play with for the dinner. All the photos in this post are taken with this Android phone. I'm presenting them "as is", unedited, so you can see the quality. I was quite surprised at how well it did in such low light conditions, and also when taking harsh stage lighting. 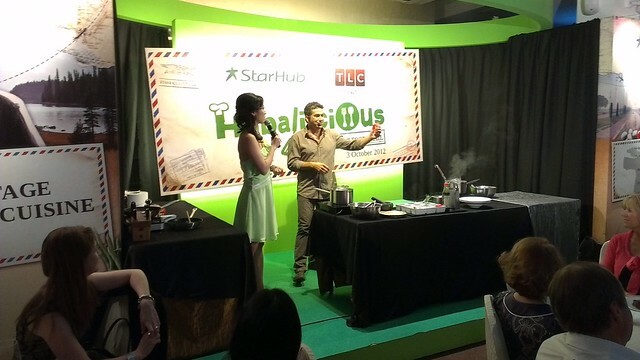 They also have a FooD.I.Y app which gives you cooking videos and recipes from Starhub's lifestyle channels. Bob and the host (left in green) kept the audience very much entertained throughout the evening. Diners were treated to not just talk, but very much a live show. Bob related a true story from his early days when he was invited to Australia to do a late night show and demo. 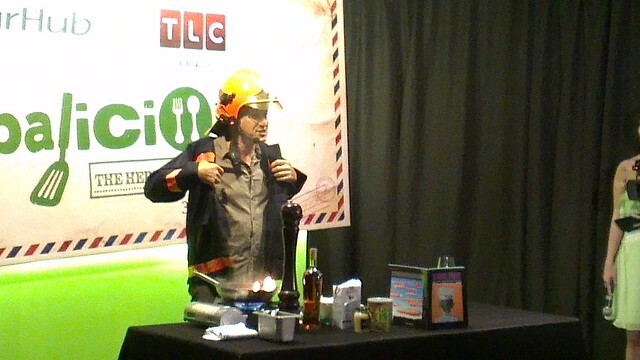 Halfway through, he starts donning a fireman's jacket and talks about how his cooking went awry with one audience participant obtusely mucking things up. That participant literally had his arm on fire and Bob thought it was the end of his career. Little did he know, the station had deliberately planted a stunt guy as the participant just to create a bit of drama. Poor Bob. He says it took him ten years to get over that traumatic episode. But of course, we all wanted to see what he would be presenting for dinner that evening. 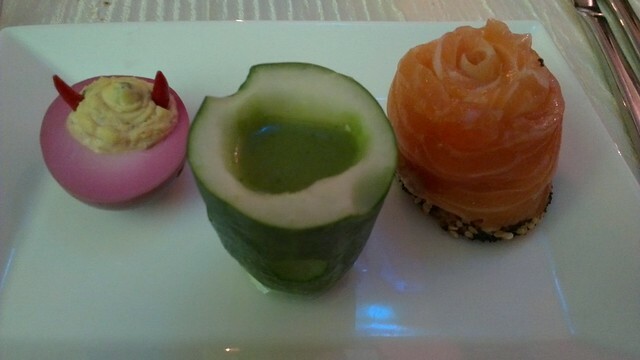 Deviled Eggs, Cucumber Shooters, Salmon Gravlox Roses - food from the era that he grew up with, plus a bit of a twist. I really like the Deviled Eggs - I'd never have thought to snip off the ends of chilies for devil horns, and they lend a really nice spicy effect to the whole ensemble. 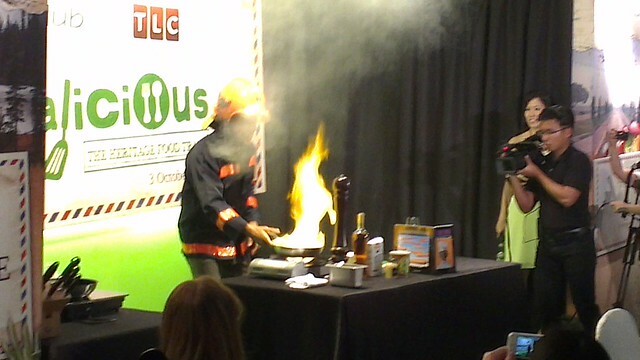 This was the dish he was demonstrating with the fire - lots of cognac. It smelt so good when he was browning it. Of course, Bob being Bob would definitely want a competitive showdown, in the style of Glutton for Punishment. In the West, he'd do something involving cooking a dish from scratch that didn't take longer than opening a can of Spaghetti-Os and heating that up. For something quintessentially Singapore, he picked this challenge - instant noodles. He wanted to show that he could prepare and cook a tasty pasta dish (involving almost a dozen ingredients) in the same time it took someone to cook instant noodles. We had this audience member as a sporting participant to cook the instant noodles. 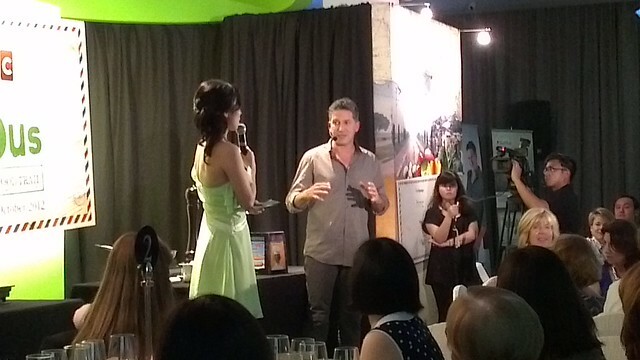 He made us all laugh when he got asked a question about a certain ingredient. Bob indeed managed to finish his speedy pasta (gosh, it was a whirlwind of prep and stir) just a couple seconds earlier than the instant noodles. And for the ultimate test, we had three judges to see if the pasta dish was tastier. Bob takes one to the chest as the second judge meekly said he liked the instant noodles. But he still won 2 out of 3 in the taste test. So, healthy cooking and eating, everyone! The only thing is - cleanup takes much much longer with so many ingredients! 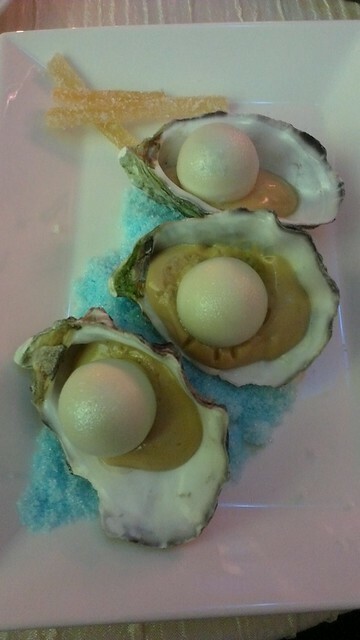 Dessert was "Pearls of Wisdom" - giant pearls of white chocolate, each with a different filling (champagne, tiramisu, and chipotle), all on real oyster shells, and sandy blue sugar. Served with candied orange strips. So pretty and whimsical. 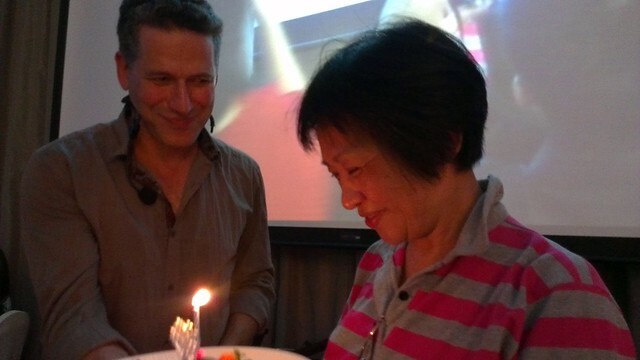 There was a nice gesture of a special birthday cake with song and kiss on cheek for one of Bob's fans - this lady here, who happened to be sitting next to me! Hey, can it be my birthday too? Nice seeing you again, Bob. Will you be back next year? We hope so. Anyway, he's got a new series coming up - World's Weirdest Restaurants. 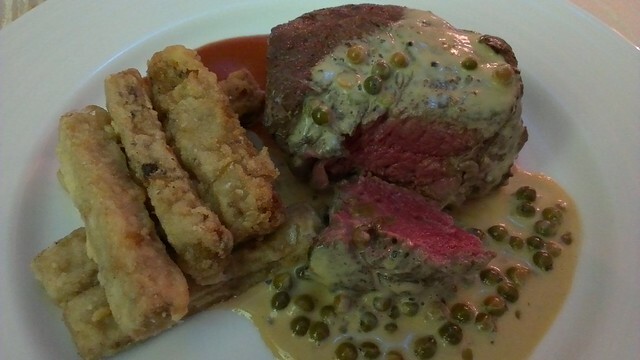 Not so much about weird food, but themes and concepts. I remember trying my darndest contributing to their research for the Singapore leg, but am not sure if we're weird enough. We could really do with more quirky stuff in Singapore. But I can't wait to see what unusual stuff other countries offer too. We had a sneak preview, and it looks cool. Watch for it in early 2013. 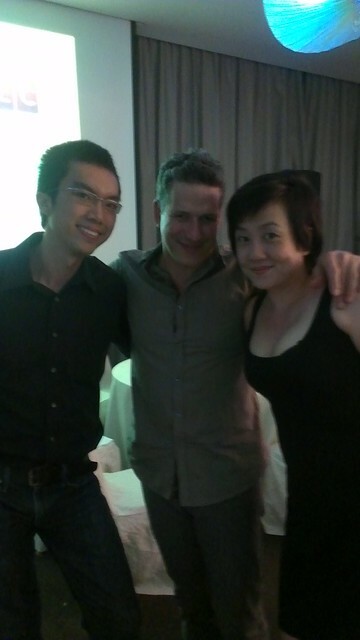 Many thanks to Starhub for the Hubalicious invitation. We love the extra special touch being chauffered to and from the event!